To evaluate the dynamic contrast-enhanced MRI parameters for monitoring the neoadjuvant chemotherapy (NAC) response in osteosarcoma prospectively. A total of 19 patients with osteosarcoma were recruited and underwent two dynamic contrast-enhanced MRI (DCE-MRI) examinations before and after chemotherapy. Patients with ≥ 90% tumor necrosis were defined as responders (10 patients), and those < 90% necrosis were defined as non-responders (9 patients). Primary tumor kinetic parameters of DCE were measured including Ktrans, Kep, Ve, and Vp with the extended Tofts model. The change in tumor volume was also recorded in the treatment cycle. The changes between responders and non-responders were compared using t test or Mann–Whitney U test. The ROC curves were used to evaluate the ability of DCE parameters for differentiating the responders and non-responders with respect to chemotherapy. Statistically significant differences were not detected in Ktrans, Kep, Vp, Ve, and MRV between responder and non-responder groups before chemotherapy. The Ktrans and Kep showed significant differences between responder and non-responder groups after completion of NAC (P < 0.05). Compared to the non-responders, the Ktrans and Kep were significantly lower in the responders than non-responders after completion of NAC (P < 0.05). The sensitivity, specificity, and diagnostic accuracy of Ktrans (Ktrans-post) and Kep (Kep-post) were distinguished between the non-responder and responder groups. Ktrans (Ktrans-post) and Kep (Kep-post) were analyzed together to differentiate between responders and non-responders that revealed the largest AUCs. The current study showed that the DCE parameters could adequately monitor the response to NAC in the osteosarcoma treatment cycle. ·Dynamic contrast-enhanced MR imaging (DCE-MRI) provides functional information on tumor vascularity and hemodynamics. ·Some DCE-MRI parameters have a good performance in differentiating responders from non-responders osteosarcoma during neoadjuvant chemotherapy. 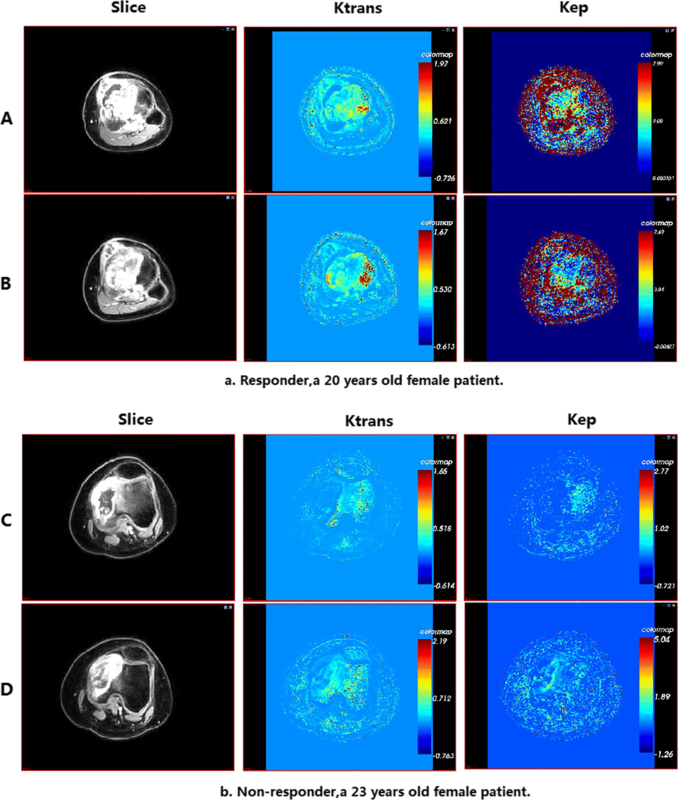 ·Kinetic parameters of DCE-MRI might be potentially optimal noninvasive radiological prognostic indicators for osteosarcoma. Osteosarcoma is the most common primary malignant bone tumor with a peak incidence in childhood and adolescence. The neoadjuvant chemotherapy (NAC) has improved the disease-free survival (DFS) remarkably. However, the neoadjuvant chemotherapy drugs have multiple side effects on adolescents’ body, such as secondary malignancies and immune system damage . Moreover, chemotherapy resistance affects the efficacy of neoadjuvant chemotherapy . Therefore, it is essential to monitor the response of tumor to chemotherapy in order to determine the appropriate chemotherapy regimen and cycle. The necrosis rate of tumor is the standard histological evaluation method for the chemotherapy response. It is significantly associated with the survival rate . However, tumor necrosis can only be assessed in resected specimens after the completion of NAC. In order to overcome this limitation, several imaging examinations could monitor the response to drugs after the completion of NAC before surgery, such as computed tomography (CT) , magnetic resonance imaging (MRI) , and 18F-fluoro-2-dexoy-d-glucose (18F-FDG) positron emission tomography (PET) . Dynamic contrast-enhanced MR imaging (DCE-MRI) offers a noninvasive method that can assess the tumor perfusion and permeability . It has also been used to predict the histological response in chemotherapy of osteosarcoma [8, 9, 10]. However, to the best of our knowledge, only a limited number of studies have investigated the quantitative permeability parameters of osteosarcoma in chemotherapeutics. 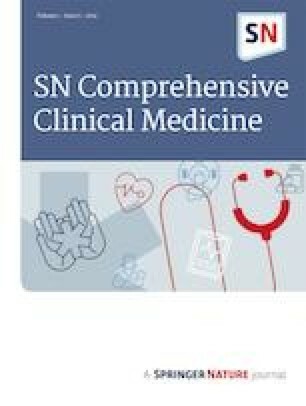 The purpose of this study was to assess whether the imaging parameters (tumor volume based on magnetic resonance (MR) images (MRV), perfusion maps of the volume transfer constant (Ktrans), reverse volume transfer constant (Kep), extravascular extracellular volume fraction (Ve), and the blood volume fraction (Vp)) [11, 12] of the DCE-MRI could be used as predictors of the histological response to the NAC in patients with osteosarcoma. Eligibility requirements include newly diagnosed histologically proven primary osteosarcoma, the completion of neoadjuvant chemotherapy and surgery, sequential DCE-MRI scans obtained before and after the completion of NAC, and the scanning parameters identified to those of the first dynamic-enhanced MRI. The exclusion criteria are comprised as follows. The complete pathological data or clinical data could not be collected as patients failed to complete the routine chemotherapy. Between 2016 and 2017, there were 30 patients diagnosed with osteosarcoma in our hospital, and 19 patients of whom were enrolled in the experiment (10 males and 9 females; mean age, 15 years; range, 10–23 years). The locations of primary tumor included femur (10 cases), tibia (4 cases), ilium (1 case), and humeri (4 cases). In addition, there were 18 cases of osteoblastic osteosarcoma and 1 of chondroblastic osteosarcoma according to the pathological subtype. The MRI data of all the 19 patients was analyzed. All patients provided written informed consent. The study was approved by the institutional research review board and performed according to the ethical guidelines of the clinical research committee of China–Japan Hospital of Jilin University. The conventional chemotherapeutic drugs of osteosarcoma included methotrexate, pyridoxine, and isocyclophosphamide. Our hospital administered three periods of routine treatment (the duration was about 9 weeks). All cases underwent operation within 4 weeks after the completion of NAC. All subjects were routinely scheduled to undergo two MRI examinations, before treatment (Tx-pre) and after neoadjuvant chemotherapy completion (Tx-post). The MRI examination was performed with the 3.0 T superconducting whole-body MRI equipment (Skyra, Germany). The knee joint coil or body coil was selected. Our hospital scan sequences included axial and coronal T1-weighted imaging (repetition time/echo time (TR/TE):433.5/10.0 ms), axial and coronal T2-weighted imaging (repetition time/echo time (TR/TE): 5446.6/130.0 ms), and axial T2-weighted imaging with fat suppression (repetition time/echo time (TR/TE): 2280.2/65.0 ms) for osteosarcoma. The following parameters were used in the DCE-MRI: repetition time (TR) 4.8 ms and echo time (TE) 1.5 ms. The injection rate of Gd-DTPA was 3 mL/s at a concentration of 0.1 mL/kg, followed by the injection of 20 mL normal saline. The enhancement sequence began with the simultaneous injection of the contrast agent. There was no time interval in the continuous scanning for 10 cycles. The temporal resolution was 25 s, and the total acquisition time was 4 min. The tumor length was measured in coronal sections of unenhanced T1-weighted sequence and the tumor width in the axial section of unenhanced T1-weighted sequence, while the depth was measured in the axial section of the T2-weighted sequence. The MR images were reviewed by two authors independently. When the size discrepancy was > 10%, the images were reviewed by two authors and the decision was based on the consensus. The tumor volume (MRV) was calculated with the formula for the elliptical mass: volume= π/6 × height × width × depth . With the GE software of the post-treatment workstation of DCE-MRI (Omni Kinetics, GE Healthcare), the most obvious solid area of the tumor (avoiding necrosis, hemorrhage, cystic degeneration, and tumor bone composition) was selected as the region on interest (ROI) before and after the completion of NAC on the phase that is the maximum contrast between the tumor and other areas. The quantitative parameters of ROI were analyzed using a two-compartment model based on the extended Tofts model, including perfusion maps of Ktrans, Kep, Ve, and Vp. The histopathological response to NAC was determined by the degree of necrosis in the resected tumor. Tumor necrosis ≥ 90% indicated a good response and < 90% indicated a poor response . MR images from this study are available upon reasonable request. SPSS22 software was used for data analysis. Experimental data were presented as arithmetic mean. The normality of data distribution of DCE-MRI parameters was determined with the Shapiro–Wilk test. Then, the difference in DCE-MRI parameters between responders and non-responders was examined with the Mann–Whitney U test before and after completion of the NAC. The ROC curves were generated to evaluate the diagnostic ability of the parameters as predictive imaging markers of the response to chemotherapy. P < 0.05 at the 95% confidence interval (CI) was considered statistically significant in DCE-MRI parameters according to the histological response. A total of 19 consecutive patients with osteosarcoma were registered prospectively between 2016 and 2017 and the characteristics summarized in Table 1.The median age of the patients was 15 (range, 10–23) years. The responder group consisted of 10 patients, while the non-responder group comprised of 9 patients based on the tumor necrosis rate. DCE-MRI parameters of the responder and non-responder groups before and after the completion of NAC were presented in Tables 2 and 3 and Fig. 1. Table 2 showed the values of DCE-MRI parameters in responders and non-responders before NAC. The values of Ktrans, Kep, Vp, Ve, and MRV did not show any significant differences between the responder and non-responder groups before the NAC (P > 0.05). Table 3 showed the values of DCE-MRI parameters in responders and non-responders after the completion of NAC. The Ktrans and Kep differed significantly between the two groups after completion of NAC (P < 0.05). The change in MRV in the responder and non-responder groups before and after the NAC was presented in Table 4.The ∆MRV did not show significant difference between the two groups after the NAC (P < 0.05). Boxplots (Fig. 1) showed the difference in Ktrans-pre, Kep-pre, Ve-pre, Vp-pre, Ktrans-post, Kep-post, Ve-post, and Vp-post between the responder and non-responder patient groups with respect to the response to NAC. Thus, the kinetic parameters were altered between the responder and non-responder groups after NAC (P < 0.05), thereby indicating that Ktrans-post and Kep-post were putative discrimination markers. Based on the graph trend in Fig. 2, Ktrans and Kep of the responder group (10/19) decreased significantly after the completion of NAC. However, the changes in Ktrans and Kep were not significant in the non-responder group (9/10) before and after chemotherapy. Figure 4 showed representative MRI morphological and functional performance of the two groups before and after treatment, respectively. The Ktrans values of the responder group were 0.1171 vs. 0.0333/min and 0.1222 vs. 0.1661/min in the non-responder before and after treatment, respectively. The Kep values of the responder were 0.2314 vs. 0.0963/min and 0.5821 vs. 0.5463/min in the non-responder group before and after treatment, respectively. The ROC curve analyses of DCE-MRI parameters are described in Fig. 3 and Table 5. Based on the results of ROC curve analyses, Ktrans (Ktrans-post) and Kep (Kep-post) are critical for the differentiation of responders and non-responders in single factor analysis. The sensitivity, specificity, and diagnostic accuracy of Ktrans (Ktrans-post) and Kep (Kep-post) were 77.8%, 100%, and 91.1% and 100%, 90.0%, and 94.4%, respectively. 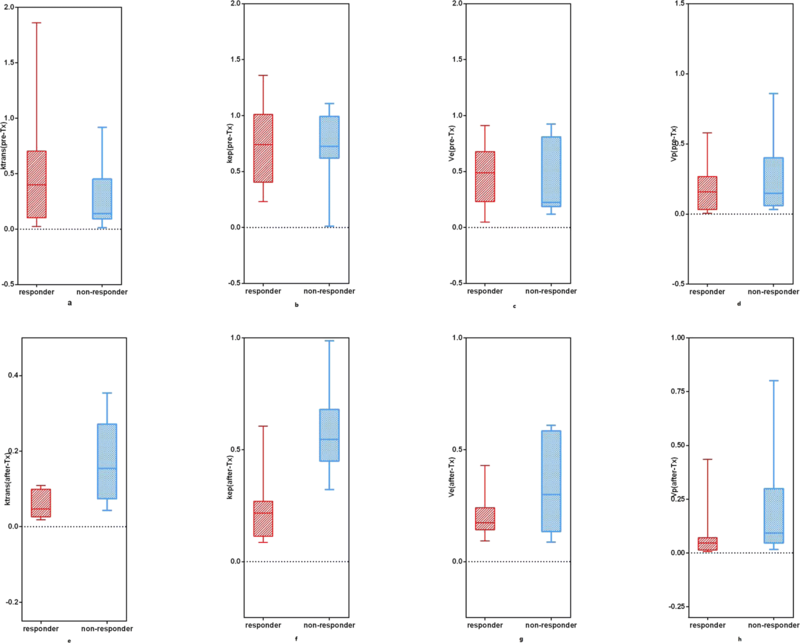 To predict a poor histological response, the highest AUCs values of Ktrans (Ktrans-post) and Kep (Kep-post) were higher than the cutoff value simultaneously in multiple factor analysis. The sensitivity, specificity, and diagnostic accuracy of Ktrans (Ktrans-post) + Kep (Kep-post) were 100%, 88.9%, and 98.9%, respectively. The Kep + Ktrans refers to the ROC diagnostic probability. When the values of Ktrans and Kep are above their boundary values respectively, the diagnostic probability will be more accuracy than single element analysis. It can estimate the tumor necrosis rate when it is less than 90%. The present study has found that the change in MRV after NAC could not predict the histological response in osteosarcoma. In addition, the parameters of DCE-MRI were useful in identifying the histological response in patients with osteosarcoma after the completion of NAC. 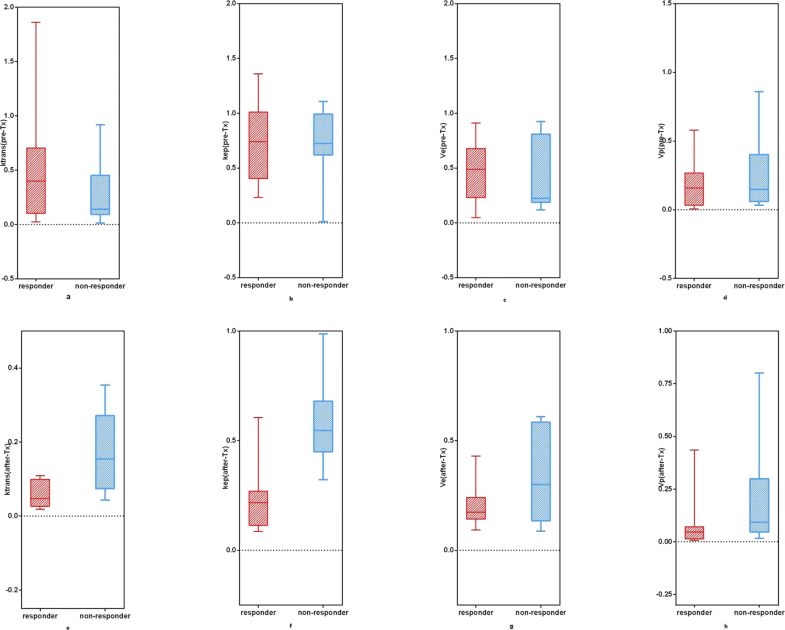 Among DCE-MRI parameters calculated after the completion of NAC, the Ktrans and Kep values were independent predictors of the histological response. This study demonstrated that non-responders could be distinguished noninvasively by DCE-MRI after completion of NAC with quantitative results (Fig. 4). Although the median values of MRV tended to decrease after chemotherapy (from 193 to 144 mL in good histological responders, from 204 to 151 mL in poor histological responders) in the current study, the altered volume after NAC could not evaluate the chemotherapy statistically. Some studies indicated that the change in tumor volume predicted the effect of NAC on tumor [14, 15, 16]. Other studies showed that patients with enlarged tumor volume had poor chemotherapy response and low tumor necrosis rate . These differences might be attributed to several potential causes as follows. First, slow regression of osteoid matrix and cystic degeneration increased the tumor size in good responders, while the active part of tumor decreased distinctly [18, 19]. Second, massive necrosis and bleeding can increase the tumor volume in good responders . Finally, the relatively small sample size in this study could limit the ability to detect the significant differences. The current study suggested that MRV was one of the major factors for the evaluation of the chemotherapeutic response, while it could not be the most valuable indicator. The tumor microenvironment might alter continuously after NAC irrespective of the MRV change. In order to obtain the information of osteosarcoma microenvironment, multiple parameters of DCE-MRI were investigated to assess the treatment response to NAC in this study. DCE-MRI is a noninvasive technology that can assess the tumor microcirculation properties quantitatively . Furthermore, the responder group presented significantly lower Ktrans and Kep values than the non-responder group at the end of NAC, while Ktrans (Ktrans-pre) and Kep (Kep-pre) of the two groups did not show significant differences. These results were not in agreement with the previous studies. Reportedly, the average pretreatment Ktrans value of the complete response group was significantly higher than the partial response group in head and neck squamous cell carcinoma . The difference of the result might be attributed to the characteristic of osteosarcoma, which contains enormous mineralization. This characteristic indicated that the active tumor cells in osteosarcoma are unevenly distributed than those in head and neck squamous cell carcinoma. Therefore, we could not predict the response of tumors to chemotherapy via dynamic enhancement parameters before chemotherapy. 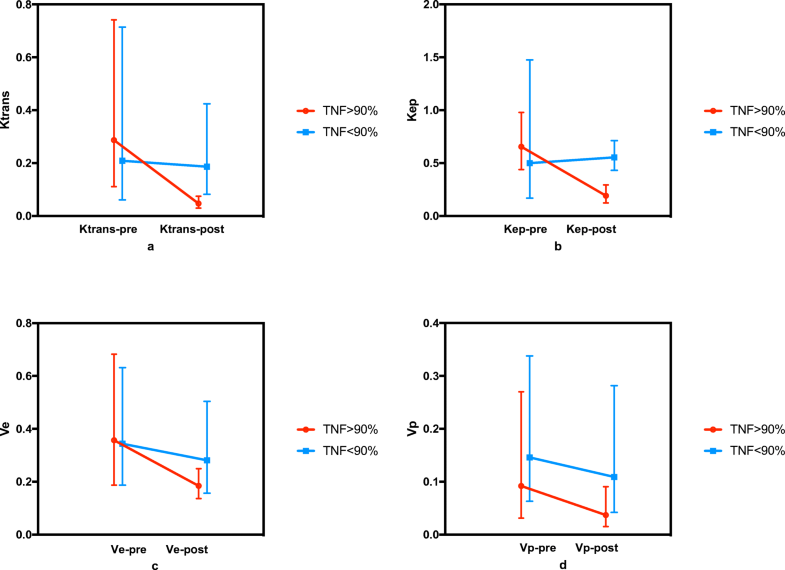 The current results found that the Ktrans and Kep values in the responder group decreased significantly compared to the non-responder group at the end of NAC. The Ktrans (Ktrans-post) and Kep (Kep-post) reflected the pathological state of tumor tissue during NAC treatment. The results may be related to the decrease in microvascular densities and permeability of the vessels and the increase in the extracellular space, because the chemotherapy prompts the tumor cells to undergo necrosis and fibrosis. In addition, a combined application of Ktrans and Kep achieved 98.9% diagnostic accuracy, which was higher than each parameter, respectively. Therefore, checking the change in Ktrans and Kep may be a potential noninvasive approach of monitoring the NAC response of osteosarcoma. Guo et al. demonstrated that Ktrans, Vp, and ΔKep at week 9 in osteosarcoma were significantly different between responders and non-responders . This variation tendency of Ktrans was in agreement with the current study. But data discretization of our research was more stable. The difference might be attributed to the selection of ROIs. Also, Ktrans and Kep are determined by microvascular blood flow, vessel permeability, and vessel density [11, 12]. Therefore, we speculated that if ROIs contained large areas of necrosis, hemorrhage, and cystic degeneration by cytotoxic chemotherapeutic drugs, the accuracy of DCE parameters could be affected. The change in the Ve value has been reported to be clinically critical in assessing the tumor response to treatment . However, we did not find an obvious decrease in Ve after NAC in the current study. This result indicates that the microvasculature of the tumor may change after chemotherapy; however, no significant change was detected in the extracellular space. This might due to the increased necrosis of tumor cells, resulting in enlargement of extracellular space after NAC. Therefore, further investigations of Ve are warranted in osteosarcoma. Nevertheless, the present study had several limitations. First, the relatively small sample size might limit the ability to detect the significant differences due to reduced statistical power. The estimation of Ktrans and Kep value demarcation point in a small sample study is not similar to that from standard clinical practice. Thus, further investigation with large cohorts might improve the statistical power. Second, owing to the subjective judgment of the radiologist, the delineation of the interest area could be influenced, which might cause measurement error. Last, the random motion is inevitable, especially in children. In summary, DCE-MRI is feasible in differentiating the responders from non-responders during the NAC course in osteosarcoma with quantitative parameters. Ktrans and Kep might be potential noninvasive prognostic indicators for osteosarcoma to avoid ineffective NAC in non-responders. Thus, further studies with a larger sample size are required to verify the value of DCE-MRI in monitoring the response to chemotherapy in osteosarcoma. The study was approved by the institutional research review board and performed according to the ethical guidelines of the clinical research committee of China–Japan Hospital of Jilin University.